Welcome to our complete how to guide on playing the RaceBets Jackpot Freeroll game. New and existing customers are eligible to take part in this jackpot game and best of all it’s free to play. 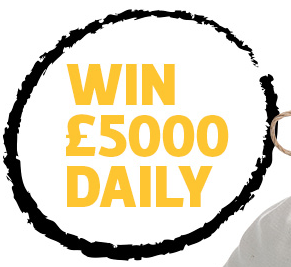 The prize money on offer is an astonishing £5,000, and that’s available on a daily basis. The only downside to the game is that you can only play it through via desktop. So if you use the RaceBets mobile app (mobile optimised website), you’ll need to switch the view to desktop. To take part in this daily jackpot game you must be an existing member at RaceBets. If you don’t have an account as yet don’t worry, you can register at www.racebets.com. Once you have registered your account you can login, deposit and place bets through the mobile optimised website (especially for smartphones) or via their desktop version. The images above takes you through the mobile registration page and the steps you need to take to complete the signup process. What Is RaceBets Jackpot Freeroll? The Jackpot Freeroll game is a free horse racing bet, which is available to anyone who has an active RaceBets account. Each day you play you might see slight differences in the way they select the races. Some day’s you might find that the featured races are all from the same race meeting, other days there might be a mixture of races spread between other race meetings taking place in the UK and Ireland. In order to qualify to play Jackpot Freeroll, you must be an existing account holder, who has deposited and placed a bet via the RaceBets website or mobile app to the amount of £10. The other requirement, is that your account has to be eligible to receive bonuses. To Win You Need To! To be victorious and take home the daily jackpot of £5,000, you must pick the winners of each of the featured races for that particular day. You will only get one pick from each race, so make your selections carefully. To learn more about the RaceBets daily Jackpot Freeroll click on the image directly above. There you’ll have access to all the T&C’s of the offer etc. Please feel free to share on social media, because we all know that sharing is caring. You can also find us on Facebook, Twitter and G+. Good luck in picking your winners!